When becoming a mom, I found out that both me and my child spent a lot of time of the floor, which nowadays most homes have hardwood floors or tile, granted carpet is not much better but it has a little cushion to it. I would get up and my knees would often be puffy from sitting on them and I am sure my child also didn't feel so great after being on the floor for hours at a time. 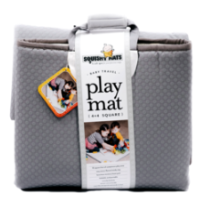 Now more parents are aware of this issue and Squishy Mats have come up with a solution. 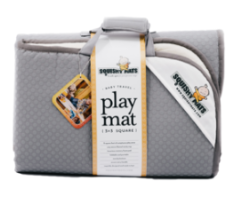 Squishy Mats are a wonderful way to enjoy more places with your kids, but they don't have to be just for kids you can also use for yourself when going out to the beach, park and more. I know I enjoy the Squishy Mat at Bok Tower Gardens, my kids enjoy running around so I normally find a spot and sit in the grass but now I no longer have to sit in the grass which is helping my jeans keep their color and not have dirt or grass stains. 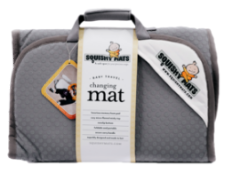 The Squishy Mat comes in 3 sizes, The Skinny Mini which is a 16" x 32" great for smaller pets, infants, changing station, tummy time and mom's behind while holding baby. The next size up is The Little Squishy which is 3' x 3' great for a play pin, medium size pet, playtime, and more. Finally the last size and the largest is the The Big Squishy a 4' x 4' also great for a play pin, larger pet and so much more, this is the size I prefer because it folds well and has a good space to it.